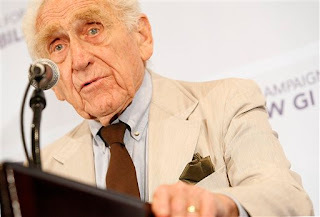 LOS ANGELES — James Whitmore, the many-faceted character actor who delivered strong performances in movies, television and especially the theater with his popular one-man shows about Harry Truman, Will Rogers and Theodore Roosevelt, died Friday, his son said. He was 87. The Emmy- and Tony-winning actor was diagnosed with lung cancer the week before Thanksgiving and died Friday afternoon at his Malibu home, Steve Whitmore said. "My father believed that family came before everything, that work was just a vehicle in which to provide for your family," said Whitmore, who works as spokesman for the Los Angeles County Sheriff's Department. "At the end, and in the last two and a half months of his life, he was surrounded by his family." His long-running "Give 'em Hell, Harry," tracing the life of the 33rd president, was released as a theatrical movie in 1975. Whitmore was nominated for an Academy Award as best actor, marking the only time in Oscar history that an actor has been nominated for a film in which he was the only cast member. His Teddy Roosevelt portrait, "Bully," was also converted into a movie. He later became the TV pitchman for Miracle-Gro plant food, and used the product in his large vegetable garden at his Malibu home. While not known for his politics, Whitmore was an early supporter of President Barack Obama. He stumped for Obama during a 2007 rally at the Gibson Theatre at Universal Studios, telling the crowd that Obama had the wisdom "to deal with a very, very confused and complex country, and the world." Whitmore also appeared in TV commercials in 2008 for the "First Freedom First" campaign, which advocates religious liberty and preserving the separation of church and state. Whitmore had regularly attended an Oscar night bash, Night of 100 Stars, and had sent in his RSVP for this year, said Edward Lozzi, a spokesman for agent Norby Walters' gala. Whitmore started both his Broadway and Hollywood careers with acclaimed performances, both as tough-talking sergeants. In 1947, discharged a year from Marine duty, he made his Broadway debut in a taut Air Force drama, "Command Decision." He was awarded a Tony for outstanding performance by a newcomer.